Highlights of Mr. Kim’s 2017-18 season include appearing as soloist with The Philadelphia Orchestra under the baton of Music Director Yannick Nézet-Séguin​; ​teaching/performance residencies at Bob Jones University, Haverford College, Swarthmore College, Brevard Music Center, and the Aspen Music Festival and School; continued appearances as concertmaster of the All-Star Orchestra on PBS stations across the USA and online at the Kahn Academy; and recitals, speaking engagements, and appearances with orchestras across the United States, including Alaska. In September, he will appear with famed modern hymn writers Keith and Kristyn Getty at the Grand Ole Opry House in Nashville and in December at Carnegie Hall. 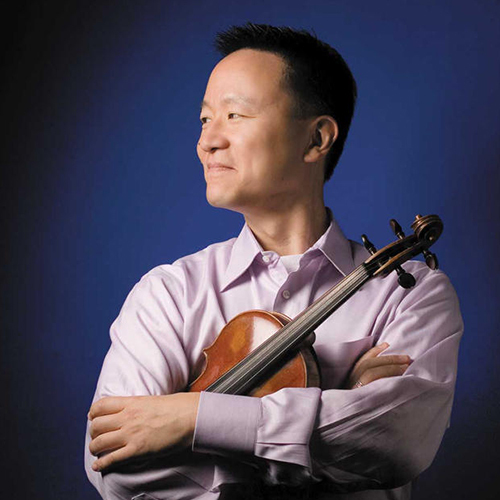 He is the founder and Artistic Director of the annual David Kim Orchestral Institute of Cairn University in Philadelphia, where he is also a Professor of Violin Studies. Additionally, Mr. Kim serves as Distinguished Artist at the ​Robert McDuffie Center for Strings ​at ​Mercer University ​in Macon, GA, a post that begins in the fall of 2017. ​Mr. Kim has been awarded Honorary Doctorates from Eastern University in suburban Philadelphia, the University of Rhode Island, and Dickinson College​. His instruments are a J.B. Guadagnini from Milan, Italy ca. 1757 on loan from The Philadelphia Orchestra and a Michael Angelo Bergonzi from Cremona ca. 1754. Mr. Kim resides in a Philadelphia suburb with his wife Jane and daughters Natalie and Maggie. He is an avid runner, golfer, and outdoorsman.